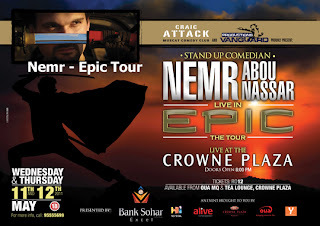 This Wednesday and Thursday night sees the latest instalment from the Craic Attack hosted by the Crowne Plaza from 8pm on both nights. As always, a very special thank you to the team at Hi FM and ALIVE Entertainment for the tickets. Tickets are RO 12 and are still available from OUA in MQ and the Tea Lounge at the Crowne Plaza hotel. 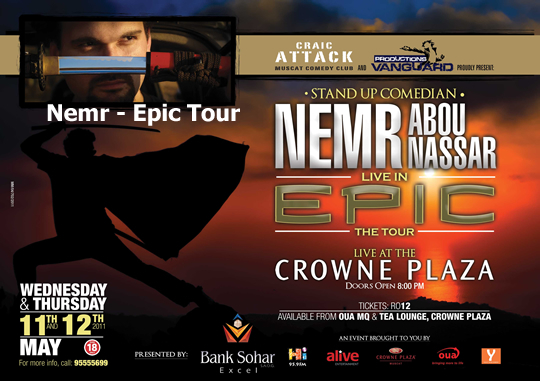 The main comic this time around is Nemr Abou Nassar, “Lebanon’s King of Comedy” who has previously done shows here in the last 2 years, and appears to be doing quite well with his latest tour "Epic". I will draw the winners on Tuesday evening! I'd love two tickets chuck - put my name in the hat!! i love comedy...and definitely could use something to cheer me up! hope i win it! Hi there, thanks for a great blog and for keeping us posted on the happenings around Muscat. So, if we don't win a pair of tickets, we'll have to drive around tomorrow in the heat looking for who's still selling them. Thanks!